The Kindle’s reception in Germany — the world’s second biggest book market — has been lukewarm at best. Can Kobo do better? BERLIN: When Amazon’s German Kindle store launched in April of this year, the response from German readers was underwhelming. Though the store featured a selection of 650,000 e-books, including approximately 25,000 German-language e-books, the Kindle device was not localized and would cost German customers more than it had when they had the option of purchasing it from the US site. According to report in Der Spiegel, 71 of the top 100 titles on its bestseller list at the time of the launch were available for the Kindle. Industry speculation about what impact the Kindle store would have on the German e-book market quickly turned to questions about who would be the next big player to try their hand at the market. The field remained wide open for a competitor to capitalize on Amazon’s early stumble. That question was answered this week when Toronto-based Kobo launched its own German store, which far surpasses the Kindle store in terms of title selection. The German Kobo store has 2.4 million e-books available, including 80,000 German-language titles. The firm also announced the release of German-language apps for the iPhone, iPad, Android smartphones and Tablet PCs. An app for the BlackBerry PlayBook is also on the horizon and e-books can also be purchased and downloaded directly from kobo.com. Its German-language e-reader Touch will be available for purchase in August for €149. That the Canadian upstart has set its sights on a global strategy should come as no surprise. 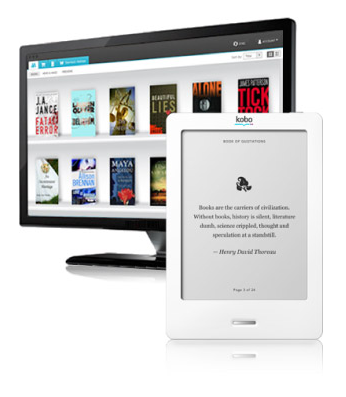 Launched in December 2009, the Kobo platform reached the one million user mark within 10 months. Now, less than two years later, its customer base is up to 4.2 million, with readers in 200 countries at that. Before the German launch, Kobo already had localized stores in Canada, the UK, Hong Kong, and Australia, along with a retail presence in New Zealand. And according to Kobo, this is just the first in a series of international rollouts, with plans to launch local-language e-bookstores in France, Spain, Italy and the Netherlands, all hopefully by the end of the summer, according to Kobo CEO Michael Serbinis. Last month at the Editech conference in Milan, Michael Tamblyn, Kobo’s EVP Content Sales & Merchandising, spoke to Kobo’s global approach, pointing out that books represent a clash of cultures and that e-books in particular highlight the difference in how Americans and Europeans see books. He noted that, to be successful, an e-book retailer needs to strike a balance between a book sale as a commercial transaction and a book sale as a cultural act. “E-books are files, wrapped in a license, surrounded by technology, delivered by a contract. E-books are also books, wrapped in cultural life, surrounded by readers, delivered by history. The e-book retailer who wishes to succeed in Europe understands both,” said Tamblyn. Germany’s book market is the second largest in the world, after the U.S., and thus a logical place to expand. But e-book sales continue to represent a very small fraction of overall book sales in Germany. According to the market research firm GfK Group (Gesellschaft für Konsumforschung – Society for Consumer Research), in 2010, only 35% of German publishers were offering e-books at all, though nearly 80% had intentions of entering the digital market at the time of the study. In addition, e-books made up only 0.5% of overall book sales in 2010 and just 5% of the 417 million euros in sales in the growing German download market (including digital purchases of music, audio and e-books, software, games and videos). E-book pricing is a particular issue in Germany, where fixed book pricing applies and where e-books are subject to a significantly higher VAT rate than printed books. But as Kobo CEO Michael Serbinis told CNET, Europe is generally about two years behind the US in terms of e-book adoption. In other words it’s just a matter of time before e-books constitute a bigger force in Germany. Among the suppliers who have signed on with Kobo are arvato’s BIC Media, Bookwire and German industry e-book platform libreka! –- developed collaboratively under the umbrella of the German Publishers and Booksellers Association’s subsidiary MVB Marketing- und Verlagsservice des Buchhandels. Ronald Schild, Managing Director of the MVB told the Börsenblatt, “This partnership opens up an additional international sales channel for the e-books of our publishing partners.” There are currently 76,000 novels, reference and non-fiction titles available in e-book format on libreka! Kreutzfeldt pointed out that Kobo’s social reading platform “Kobo Reading Life”, which provides users with statistics about their own reading habits and connects the reading experience with social networks like Facebook, will also be localized for Germany. DISCUSS: Can a North American E-bookseller Dominate Europe?